Upon hearing he had been sentenced to more than 13 years in prison on Thursday night, the Venezuelan opposition leader Leopoldo López extended his arms to a bailiff to be handcuffed. “These handcuffs will be removed by the Venezuelan people,” he said. The outcome of the trial was unsurprising. The justice system in Venezuela has long been at the service of its authoritarian government, which has grown increasingly brazen in its efforts to sideline the opposition as confidence in President Nicolás Maduro has plummeted. The baseless conviction of the opposition leader Leopoldo López and three Venezuelan students for violent incidents during the country’s 2014 protests exposes the extreme deterioration of the rule of law in Venezuela, Human Rights Watch said today. The trials involved egregious due process violations and failed to provide evidence linking the accused to a crime. The 13 years and nine months prison sentence against a Venezuelan opposition leader without any credible evidence against him shows an utter lack of judicial independence and impartiality in the country, said Amnesty International. We’ve often written about one-sided political trials, which appear to be on the rise as a means of repression in unfree countries that attempt to maintain a veneer of international respectability. In recent months we’ve seen journalists and political activists cynically railroaded to prison in Azerbaijan, Egypt, Russia and elsewhere. 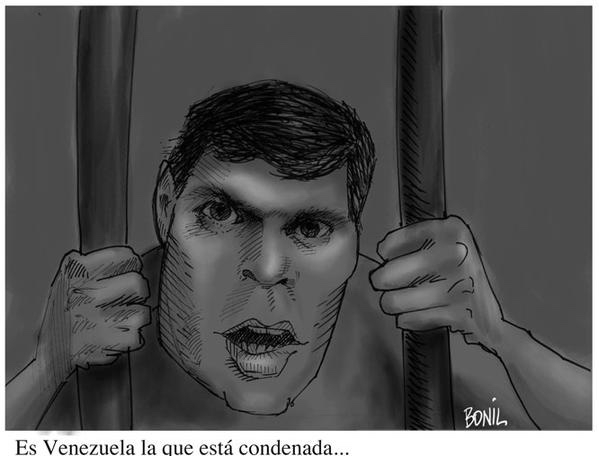 But for sheer brazenness, nothing quite matches Venezuela’s prosecution of opposition leader Leopoldo López, who on Thursday was sentenced to nearly 14 years in prison. Mr. López, 44, is, like much of the opposition movement, a reason for hope in Venezuela’s future despite the country’s disastrous political and economic collapse under the regime founded by Hugo Chávez. A moderate leftist educated in the United States, Mr. López favors peaceful democratic change; in calling for anti-government protests last year, he gave several speeches calling on his supporters to act nonviolently. Not surprisingly, his popuarity in polls exceeds that of the current president, Nicolás Maduro, by more than 20 points. I met him and it was impossible not to notice him. He stood out among everyone: young, with an impressive energy and an intelligence that suggested he would go far. Yesterday he was sentenced to 13 years and nine months in prison by a court as biased as it was malicious. On hearing the sentence I started to calculate how old his two children would be when he left prison, but I immediately stopped short. Leopold Lopez will not serve those years behind bars, I told myself, nor will he disappoint the first impression I had of him.